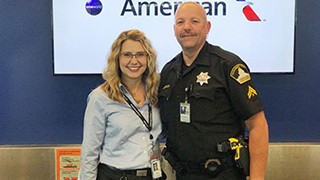 AA ticket agent Denise Miracle with Deputy Todd Sanderson. Here’s proof-positive that aware travel industry employees can make a difference in the scourge of human trafficking. Authorities say a SMF ticket agent who followed her instinct saved two local girls from an online predator. It was a typical day for American Airlines agent Denice Miracle when two young girls came to her ticket counter. They had a number of small bags but told her they had no ID. The agent noticed some warning signs. “The way they kept looking back-and-forth at each other like they weren’t really sure, and they were texting someone on the phone, and that person was giving them answers,” she said. Miracle noticed the ticket from Sacramento to New York was purchased online, the credit card was in a different name and she also noticed something else: “It was a first-class ticket; it was very expensive. I told a supervisor go to call the sheriff that it just doesn’t feel right. It just didn’t feel right,” she said. When Sacramento County Sheriff deputies arrived, the 15- and 17-year-olds told deputies they met a man called “Drey” on Instagram and he invited them to New York for the weekend to earn $2,000 for some work modeling in music videos. They had told their parents they were spending the night at the other’s home. Responding deputy Todd Sanderson said the girls had no clue the ticket had no return. Authorities believe this person is an expert at this type of thing, befriending potential victims online, and luring them away. They believe the girls would most certainly have become victims.